Here is our little RV Christmas tree. Isn't it cute - not even 2 feet from the base to the tippy top of the star!! 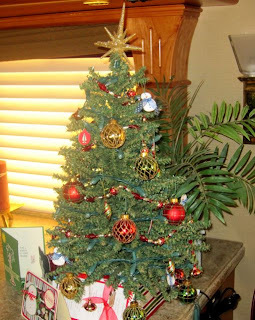 I got the tree and the teeny ornaments from Michaels (my new favorite place to shop)! 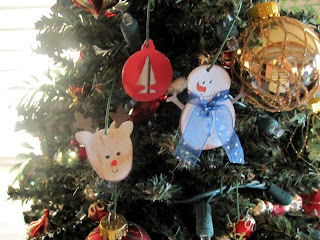 And here are three of the little paper ornaments I did just to add that "homemade" touch!! I like the little snowman best! The tree is beautiful! The homemade ornaments definitely add a nice touch. So much easier to have this type of tree compared to the humongous one that used to be in the condo....Cant wait to see all of the other handcrafted items you have been working on! So cute!! You did better than us...whenever we see a tree, we take a picture in front of it, and claim it as "ours"...next year we will get a tree! Was it real? I am not sure if Michael's just carries the antiflammable ones. Not real and very cheap - probably not antiflammable! !